Gambia's new president Adama Barrow waves to supporters as he leaves the airport in Banjul, Jan. 26, 2017, after returning from Senegal. Using a combination of diplomacy and muscle, the Economic Community of West African States (ECOWAS) forced longtime Gambian President Yahya Jammeh to cede power this month to challenger Adama Barrow, who won the nation’s general election. Neighboring Senegal amassed troops and threatened to remove Jammeh by force. Regional powerhouse Nigeria threatened to help. The presidents of Mauritania and Guinea conducted shuttle diplomacy between Gambia’s capital of Banjul and Senegal, where Barrow had fled. Jammeh finally agreed to go into exile on January 20. Despite the successful outcome, some question the wisdom of ECOWAS intervening on behalf of the people of the Gambia. Ezekiel Gebissa, a professor of history and African studies at Kettering University in Michigan, said that the military intervention is not something that should be replicated elsewhere. “If the reason for the intervention by ECOWAS in the Gambia is to save democracy and restore constitutional rule, then I think [it] would be counterproductive because a democracy that is imposed from outside by using military force cannot be an enduring democracy,” he said. Sadiq Ibrahim, a member of the ECOWAS parliament and a lawmaker in Nigeria’s National Assembly, said that although the regional body must respect the sovereignty of each member nation, there are exceptions that demand direct action. “If we have a situation that can threaten the security of a member nation and the entire region, the ECOWAS can collectively intervene to ensure peace in that country,” he said. 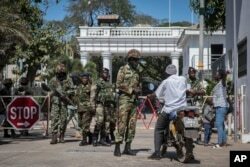 Senegalese soldiers check a motorcyclist at the entrance of the State House compound in Banjul, Gambia, Jan. 24, 2017. ECOWAS troops have moved into the State House to prepare for the return of President Adama Barrow. This was not the first time ECOWAS has intervened in the affairs of one of its member states. In 1990, the military intervention known as ECOMOG led largely by Nigeria helped end the Liberian civil war. Another ECOWAS intervention took place in Mali in 2013 where soldiers from ECOWAS countries worked in collaboration with French and other African forces. ECOWAS used Article 58 of its revised treaty relating to regional security to justify the intervention, according to Nigerian legal expert Barrister Hassan Liman. Liman said the law stipulates that member states must work to safeguard and consolidate relations to maintain peace, stability and security within the region. He added that the article does not give ECOWAS the right to use force to oust a leader. “The peculiar situation we have in Gambia is that there was a peaceful election and the president lost but refused to concede defeat. Obviously in this case the regional force can act to ensure regional peace,” he said. Liman said that Africa’s continental body, the African Union, could look to follow the example of ECOWAS as it tries to resolve crises in Burundi, the Democratic Republic of Congo and in South Sudan. Political analyst Abdurrahman Abu Hamisu said ECOWAS also has an economic incentive to prevent instability in one of its member nations. “The expenses ECOWAS would have incurred if the crisis had erupted in Gambia could have outweighed what has been spent in this intervention effort,” he said. J. Peter Pham, director of the Atlantic Council’s Africa Center, said ECOWAS has signaled for years that it would intervene in a case such as this, so its actions should come as no surprise. “There is an agreement within ECOWAS, the acknowledgment that elections stand and if you lose elections you leave,” Pham said on VOA’s Press Conference USA. Pham added that there is another lesson to be learned from the Barrow side's tactics. Aides to the newly elected president began talking about prosecuting Jammeh’s inner circle right after the election, when it was clear Barrow had won and Jammeh had lost. Nasiru Adamu El Hikaya contributed to this story from Abuja.